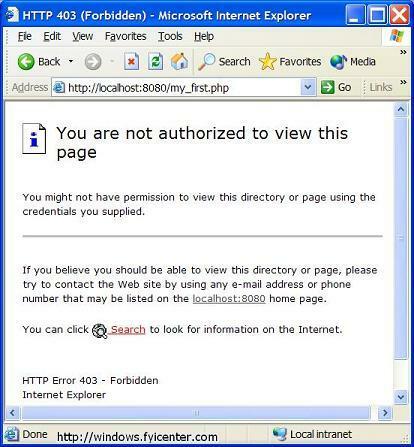 What is causing the HTTP 403 (Forbidden) error when running PHP scripts with PHP CGI configuration? If you followed the installation instructions provided by the PHP package to configure Apache server to run PHP scripts as CGI scripts, you will most likely get this HTTP 403 (Forbidden) error when running PHP scripts. This tutorial explains the issue and helps you to fix it. 1. Enter and save the following PHP script as C:\Program Files\Apache Software Foundation\Apache2.2\htdocs\my_first.php. This is <?php echo "my first PHP script"; ?>. 3. There is no permission problem with my_first.php, because it is located in the document root directory. The problem is the permission of running php-cgi.exe. 5. The cause of the problem is that C:/Program Files/php-5.2.0-Win32 is defined as script directory in the Apache server configuration, but no permission is given to that directory. This is a mistake in the PHP installation guide. 8. Restart your Apache server, the HTTP 403 error should be gone. Follow our Configuring Apache for PHP Scripts tutorial for more explanations.